Location: Not readily visible from the street, the Coach House sits back off of the street behind some other buildings. From I-5 take Camino Capistrano Exit. Head south. The Coach House is near the corner of Aeropuerto and Camino Capistrano. Notes: The Coach House is more like a leading concert house. A large variety of musical and comedy acts including many name acts that would otherwise play at larger venues. Seats are at tables, smaller cocktail style tables and the bar. About half of the seats are reserved for the dinner crowd. Diner prices are reasonable. Tickets: The Coach House box office or Ticketmaster. 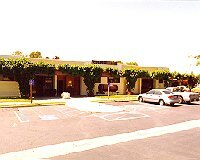 General: The Coach House also has another venue - Galaxy in Santa Ana, California. Southern California Concerts by Date - Comprehensive list of concerts sorted by date. Top Page Upcoming Concerts and Movies - Large lists of upcoming concerts and movies.